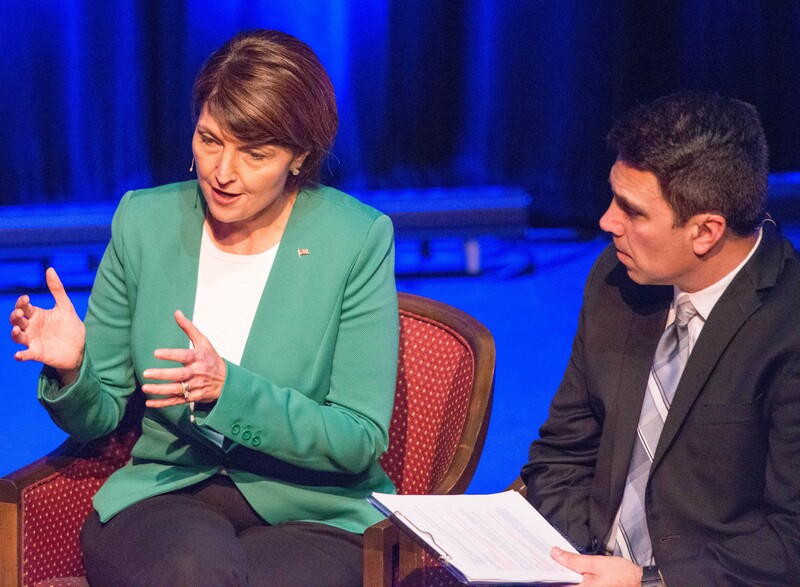 Rep. Cathy McMorris Rodgers at the debate last month. Toward the end of the first debate between Rep. Cathy McMorris Rodgers and her opponent, Lisa Brown, an audience member asked a valuable question that didn't get a clear answer. Lili Navarrete, manager of the Raiz program, Planned Parenthood's Latino community outreach effort, asked an important question: Why did McMorris Rodgers add her signature to 2015's citizen's initiative Proposition 1? But at the debate, McMorris Rodgers didn't answer why she had signed the initiative, instead using her answer to focus on an additional question Navarrete asked about families being detained at the border. So at the end of an interview today, we pressed McMorris Rodgers: Why did she support Proposition 1? Cathy McMorris Rodgers puts her name to an initiative that would overturn the city of Spokane's immigration status restrictions. McMorris Rodgers says that she believed the prohibition against asking about immigration status was impeding those types of partnerships. Yet her signature back then put her on the opposite side of her former chief of staff, Mayor David Condon. Condon opposed the ordinance. Similarly, Police Chief Craig Meidl said that crime committed by unauthorized immigrants is almost nonexistent in the Spokane area. The bigger problem is convincing refugees and immigrants to trust the police, he told us. Today, McMorris Rodgers also raises another concern about the council's immigration status ordinance. "My understanding is that [the ordinance] was a step toward making Spokane a sanctuary city," McMorris Rodgers says. And how does she define sanctuary city? "I define sanctuary city as being one where local law enforcement is not cooperating with the federal customs and Border Patrol when it comes to immigration laws," McMorris Rodgers says. 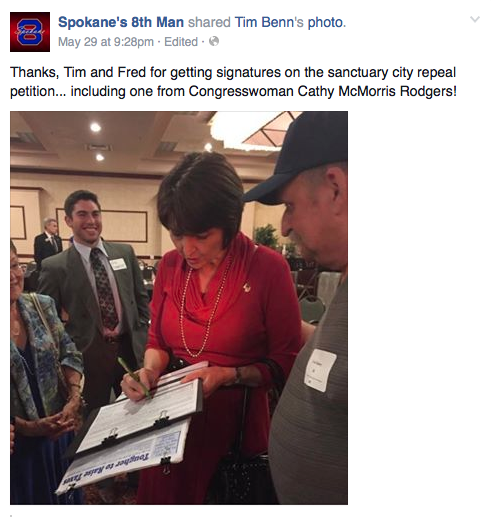 McMorris Rodgers has also said she supports defunding sanctuary cities. As we detailed at length last year, "sanctuary city," is an amorphous phrase with a number of different meanings. Spokane fits a broader definition used in 2012 by Mitt Romney, but doesn't fit most other definitions, including any of the definition that could put public funding in peril. Condon, at least, has been clear that he doesn't see Spokane as a sanctuary city. “Spokane is not a sanctuary city, although it has always been a city that works to ensure that all of our citizens feel safe, welcomed and valued," Condon wrote in a 2017 statement. She is misinformed and we never once stated that we were on our way to becoming a sanctuary city. Whether our police officers ask status or not has zero to do with cooperation between agencies. It has everything to do with the fact that people will not call the police if they are afraid the officer is going to ask their status. It is too bad that Cathy sided with the racists in our community. Lili Navarrete, the woman who asked the question at the debate, says she actually would like Spokane to become more of a sanctuary city. She says she doesn't want immigrants or refugees to live in fear. "I am hoping, yes, that it will be a sanctuary city," Navarrete says. "People who come here as refugees, I want them to feel safe in Spokane." Navarrete says that if McMorris Rodgers spent more time with the immigrants and refugees in the Spokane region the congresswoman would understand how valuable their presence is here. McMorris Rodgers' immigration positions have generally placed her square in the middle of the Republican House. She's more hardline than fellow Washington state Rep. Dave Reichert, but a lot less hardline than Idaho Rep. Raúl Labrador. On the one hand, she decried the Trump administration's family separation policy. But on the other hand, she wants the government to address the family separation by detaining children together with their parents suspected of immigration violations, instead of by releasing families until their trials.